Background/Aims: To assess auxological and safety data for growth hormone (GH)-Treated children with SHOX deficiency. Methods: Data were examined for GH-Treated SHOX-deficient children (n = 521) from the observational Genetics and Neuroendocrinology of Short Stature International Study (GeNeSIS). For patients with near-Adult height information, GeNeSIS results (n = 90) were compared with a clinical trial (n = 28) of SHOX-deficient patients. Near-Adult height was expressed as standard deviation score (SDS) for chronological age, potentially increasing the observed effect of treatment. Results: Most SHOX-deficient patients in GeNeSIS had diagnoses of Leri-Weill syndrome (n = 292) or non-syndromic short stature (n = 228). For GeNeSIS patients with near-Adult height data, mean age at GH treatment start was 11.0 years, treatment duration 4.4 years, and height SDS gain 0.83 (95% confidence interval 0.49-1.17). Respective ages, GH treatment durations and height SDS gains for GeNeSIS patients prepubertal at baseline (n = 42) were 9.2 years, 6.0 years and 1.19 (0.76-1.62), and for the clinical trial cohort they were 9.2 years, 6.0 years and 1.25 (0.92-1.58). No new GH-related safety concerns were identified. 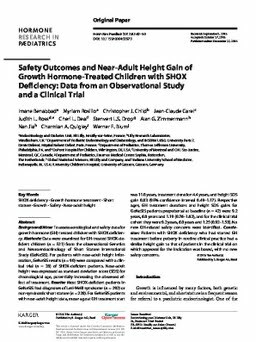 Conclusion: Patients with SHOX deficiency who had started GH treatment before puberty in routine clinical practice had a similar height gain to that of patients in the clinical trial on which approval for the indication was based, with no new safety concerns.